Making lasagna in a cast-iron skillet is a great way to put a new spin on everyone favorite Italian baked-pasta dish. This recipe features a quick, homemade beefy tomato sauce to go with no-boil noodles and a tasty spinach-and-cheese mixture. This technique can easily be adapted to your use your favorite pasta sauces, proteins, and vegetables for your own custom version of skillet lasagna. Per Serving: 412 calories; 21g fat; 12.1g carbohydrates; 42g protein; 120mg cholesterol; 844mg sodium. This recipe was great! I had heard that cooking with tomato sauce in a cast iron pan would ruin the seasoning on it, but I didn't have any problem with it. The lasagna came out nice and brown, and was perfectly cooked through. Also, way less cleanup than when i normally make lasagna! We loved this recipe! I will double the meat sauce next time as I have a 12" skillet and could of used a little more to even cheese ratio and layers. Great weeknight recipe! 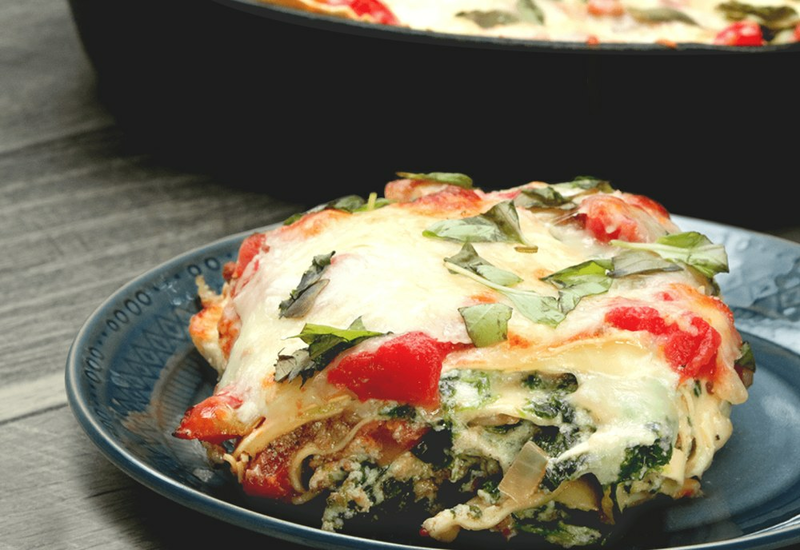 This meaty lasagna is so good! It's is a super easy recipe that I love to make, plus anytime I can use my cast iron skillet it's a win-win! I used a combination of ground beef and ground pork for this skillet lasagna. Loved the concept and it was really easy to pull off. I used an Italian-style seasoning in place of oregano and it worked out great.